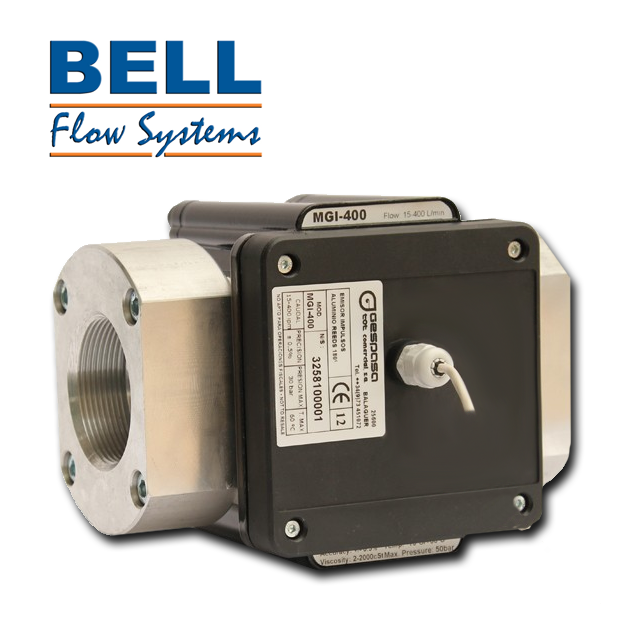 The MGI series of flow meters from Gespasa, now available from Bell Flow Systems in the UK. MGI meters are a range of pulsed oval gear flow meters, with models suitable for use with diesel, oil and AdBlue. They provide an accurate, reliable and cost effective options for measuring and monitoring fluid flow in various applications. The MGI meters for oil and diesel come in sizes from ½” to 3”. These meters give a high resolution pulse output and accuracy greater than ±0.5% of the reading. Thanks to their high accuracy, the MGI meters are ideal for use in fuel management, batching systems and also with diesel fuel consumption applications. A range of waterproof (IP66) digital and pulsed AdBlue meters provide an excellent option for monitoring fluids where there is a chance of contact with the fluid or water ingress. The meters have a hermetically sealed front, which avoids any water or AdBlue from entering the electronics. The seal also improves the overall reliability and robustness of the flow meter. Available in two flow ranges; 4-40 l/min and 5-110 l/min with accuracies of greater than ±0.8%. These pulsed meters serve a range of AdBlue dispensing and fuel transfer applications. The MGI Meters can also be paired with the new GE volume pre-set controller. The GE display is designed to connect to pulsed flow meters and control the dispensed volume. By allowinging the user to easily input the required quantity and switching a pump or solenoid valve at the correct times, accurate dispensing of fuel, oil or AdBlue is easily possible. The GE display also benefits from an external switch input. This can then be connected to a micro switch on a nozzle holder, allowing the user to switch power to a pump or valve when ready to dispense. At Bell Flow Systems we offer a wide range of fluid measurement and control products and can offer bespoke solutions for batching and fluid management applications for a variety of fuels and fluids tailored to your own requirements.